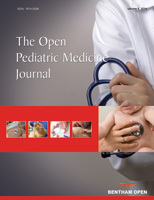 The Open Pediatric Medicine Journalis an Open Access online journal, which rapidly publishes research articles, reviews, and letters in all areas of experimental and clinical research in pediatric medicine. The focus and the topics of this journal covers research areas relevant to pediatrics including preventive health care in pediatrics, pediatric surgery, pharmacology, genetic diseases, gene therapy, cardiology, endocrinology, gastroenterology, stomatology, psychology, preventive health care, delivery of care, biomedicine, ethics, innovations and other fields related to pediatric medicine. The Open Pediatric Medicine Journal, a peer reviewed journal, is an important and reliable source of current information on developments in the field. The emphasis will be on publishing quality articles rapidly and making them freely available worldwide.